Why in Southern part of India people often use banana leaf to serve food? It need not be festival occasion but can be anytime. I remember whenever we have guests and we are short of plates to serve we used to get banana leaf from the farm or from local store. Then we slighly warm the banana leaf on both the sides on low flame and wipe with wet cloth. This is to keep banana leaf hygienic. Later the food will be served on these banana leaves. The Eco – Friendly leaves were serving dual purposes: replacing plates and no washing dishes. Traditional way of eating is on banana leaf is explained below. South Indians are fond of eating their food on banana leaves. 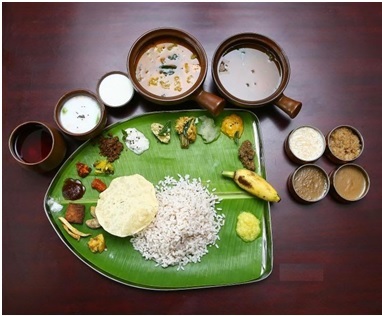 Cultural beliefs: A traditional meal on a banana leaf is necessary at any South Indian celebration. One has to eat carbohydrates in the form of white rice first, then the protein (dal), iron-rich vegetables and fat in the form of curd or yogurt. This is the order in which food is served and consumed as well. It is even more traditional to sit on the floor on a mat or a wooden stool and eat using hands and sitting in the padmasana (lotus) pose. Eating from a banana leaf is considered to be hygienic and healthy. Any guest can be served on a banana leaf which is considered humble and respectful. The order and type of foods served in a banana leaf varies from culture to culture. In general, the following is practiced in the Southern states. The leaf is placed in a way that the broader side comes on the right. This is because Indians eat on the right hand (eating with left hand is frowned upon due to historical issues of hygiene) and having the biggest part of the leaf close to the right hand makes it practical to move food from the leaf to the mouth. 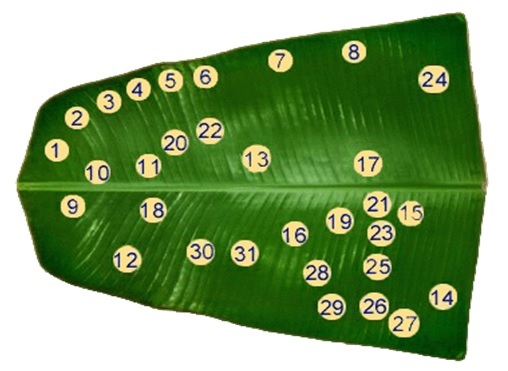 Things that are less used (such as salt – that is usually kept separate to enable the diner to add it as per his/her taste) are kept on the left of the leaf. The things on the right are usually gravy, pickle and curry that are more frequently accessed. Again it stems from point 1. Most of the wet items (including payasam and pachadi) are served on the top side away from the diner. Dry items such as Rice and papad are usually served on the bottom side. This is because the liquids can flow towards the corner and you don’ want it coming out on the diner. Also, rice is eaten more often and you want it close to the diner. The rice is also used to build a wall on the south side to prevent the liquid entry towards the guest. Sweet items (such as kesari, halva) are usually served as the first items in a leaf. Indians equate sweet to good news and thus sweet items have a royal place in the leaf. The meal is also ended with a sweet or somewhat sweet dishes (such as a payasam or curd) to leave a sweet taste in the guests’ mouths. In the main course, rasam (soup) comes first to help in digestion and rousing the appetite. The main course is ended with curd/butter milk that is again good for digestion. All the items are served in this way so that, people can reach food easily. On auspicious day salt will be served after the soup. Once the rice and other hot items are served along with homemade ghee, banana leaf will release slight aroma that makes eating enjoyable and tasty. In the past there were no plates available; banana leaves were easily available and were large enough to contain all the food. Also, there is no particular smell in the leaf that can put you off. Applying a fresh banana leaf on skin for a few hours is valuable in the natural treatment of boils and psoriasis. It relieves skin irritation, too. Applying juice extracted from banana flowers or leaves is helpful in healing burns. Banana has been used as a folk medicine among people with diabetes in the Philippines. Folkloric use of Dried Banana Leaves also includes diuretic and purgative action from leaf decoctions and the use of root parts for stomach ailments. Applying juice extracted from banana flowers or leaves is helpful in healing burns. You can also apply mashed banana and cover the affected area with betel leaves. Besides, the Banana plant is being studied for its application in the treatment of diabetes. Dried Banana Leaves Banana leaves contain ellagic acid derivatives. Like green tea, banana leaves contain large amounts of polyphenols, including EGCG. They also contain polyphenol oxidase, an enzyme that produces L-DOPA, a treatment for Parkinson’s disease. When dealing with bed sores, spread honey on a banana leaf and lie on it for a few hours to cure the problem. You can follow this procedure for treating small pox, too. Why wait? If banana leaves are available use it for your next lunch !